When configuring a new rig most people spend the most money and the most thought on their graphics card. After all, it’s pretty much the only thing running the games. You could spend all your money on an Intel i7 Extreme or a Phenom II 1100 and get some serious computing horsepower, but the best processor in the world isn’t going to do much in the way of gaming with an after thought of a graphics card. So, save your money and get a decent graphics card like this one, the Sapphire Vapor-X AMD Radeon 6770 1GB. It’s only $135, and if you were thinking about spending more than $200, two of these will scream. The Vapor-X part of the name refers to Sapphire’s cooling system and as a plus, the Vapor-X is over-clocked to differentiate it from the rest of them. The Sapphire Vapor-X AMD Radeon 6770 offers and 860MHz Core clock on a 40nm chip with 800 x stream processors. It’s also overclocked, but not by much. The stock speed from AMD is 850MHz (from what I was able to find online), but the Vapor-X cooling should all you to overclock to squeeze out some extra power. The new 6700 series is based on the previous 5700 series and is the second generation to use the 40nm design and is mostly an optimization of the 5000 series. What that brings us is a faster and cooler card. Just like the 5000 series, we also get DirectX 11 to get most out of new games like Dirt 3. With DirectX 10.1, most of the new features can be done in DirectX 9 which is why many games still use DirectX9, but with DirectX11, Microsoft has added tessellation which allows for dynamic textures as well as other graphics improvements. DirectX 11 also brings GPGPU support for direct computations on the card and advanced multi-threading support so that developers can make their games go even faster on multi-core processors like this one. In the past, DirectX 10 wasn’t quite worth upgrading to especially since it required Windows Vista or greater, and many people still liked their snappy XP machine (even though their expensive multi-core processors weren’t fully supported). With DirectX 11 it really is worth the upgrade to Windows 7 (Windows 7 is worth it anyway. You XP users need to get with the times). The Radeon 6770 also sports AMDs Eyefinity technology. This card will support up to 5 screens, though you will need a variety of adapters to plug them in. While this may sound like a great gaming experience, you might not want to use this card for games with all those screens. With each screen you are effectively doubling the number of pixels the card needs to render, so a faster card would be recommended. However, if you need all these screens for productivity, then buy away. This card also has a HDMI 1.4a port for 3D screens. If you are looking for a good mid-range graphics card this just may be it. 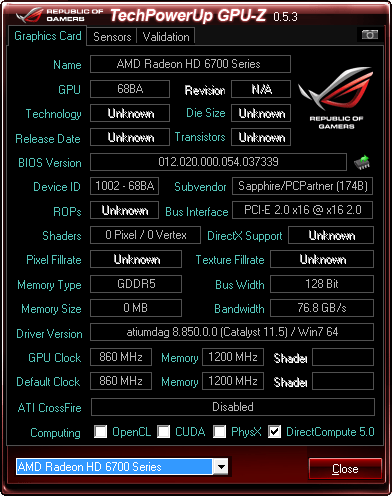 Check out what the the Sapphire Vapor-X HD AMD Radeon 6770 1GB GDD5 has in store for you after the break.